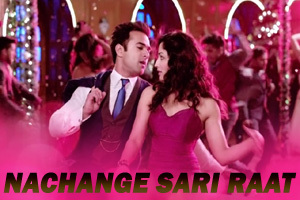 A dance song sung by Neeraj Shridhar, Meet Bros, Tulsi Kumar featuring Pulkit Samrat, Yami Gautam. The video of this song is available on YouTube at the official channel T-Series. This video is of 2 minutes 17 seconds duration. Lyrics of "Nachange Sari Raat"
Lyrics in Hindi (Unicode) of "नचांगे सारी रात"